When we first moved into our current house I was 5 months pregnant and we did not do much decorating. I was more concerned about getting baby stuff than house stuff. As time has gone by I realized our house is dull and undecorated. I tried to think of where to start to make our house feel like a home. My first thought was to start from the ground up. I started to look for a small rug for the kitchen to make it feel more comfy and uplifting. I do a lot of work at the kitchen table so I knew it had to be a bright and colorful rug. I spent a few days browsing the internet for the right rug. Many I found were drab and not very bright. Another concern of mine was being able to wash the rug. Having a son and a dog means there is always a new mess somewhere in the house. Having a rug in the kitchen that leads to outside where the dog is makes for cleaner kitchen floors. And clean kitchen floors makes this Mama happy! I found a great site Madison at Main that carries many, and I mean many rugs. The selection is vast and each is like a mini piece of art. I found a few that I loved and many were out of stock which to me means everyone else loved it too! Then as I was looking more at the rugs I found the most cheerful rug. I knew it was the one I need for my kitchen. 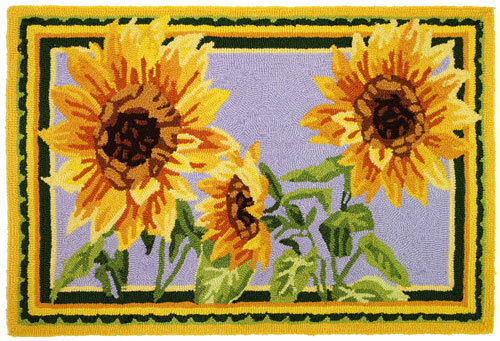 Giant Sunflowers is the name of the rug I reviewed. It is bright, cheerful and best of all Washable! Its wonderful how a rug can change the feel of a room. I love sunflowers and have grown them many times. They have a way of bringing in the sunshine and making me feel happy. The rug is thick and soft. I was surprised at how soft it was yet durable. My son loves laying on the rug and petting the flowers. The last week I have found him a few times with his pillow pet hanging out on the rug. Its really cute! Madison at Main has many rug sizes to select from to fit your rug needs. They have some really great Welcome Rugs and Fall themed rugs. I found a few that I want for other rooms in our home too. Win a Accent Rug from the Jellybean or Home Fires Accent Rug collection. Winners Choice. What Rug from the Jellybean or Home Fires Accent Rug would you love to have? Extra Entries: Can be done after leaving a comment for mandatory entry. If the extra entry says 1 extra entry leave 1 comment and 2 extra entries leave me 2 comments and so on. Love the Flora & Fauna Stripe! I'd love to win the Autumn Watch rug from the Jellybean collection! I would love the Bright Veggies Rug! I'd love to have the Beach Loungers rug! I love the Hippie Flowers! 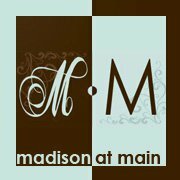 -Like Madison at Main on Facebook. This one hopefully is right! "You have just voted for Frugal Family Tree! Remember, you can vote every day." Posted your giveaway on FB as Pixie Sprinkles!